30th Anniversary year off to a great start! On September 27, 2014, our Club hosted the first ever Signing Day. 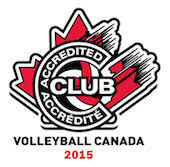 This day was introduced by the Club as a result of the OVA's new tryout window policy. At the conclusion of our try out process our coaches offered the athletes spots on their team's rosters. The Club encouraged parents and athletes to explore all of their available options knowing that on September 27, 2014 our offer would be there if they chose to sign with the Club. It was exciting to see all the athletes, coaches and parents get together on signing day but the highlight for us all was the awareness session delivered by Ms. Nicole Loretto of DIFD (Do it for Daron). Our Club President and founder, Kerry MacLean, proudly presented Ms. Loretto a $1,000 donation to DIFD to assist the organization in "inspiring conversations -- raising awareness -- transforming youth mental health". Our athletes wore the purple tryout shirts adorned with the DIFD logo (Daron's favourite colour) and will be using the shirts as we compete this season throughout the province and country in hopes of raising awareness for DIFD. The Club has also started a new tradition where we will make an annual donation to a charity that directly impacts youth in our community, province or country at the conclusion of our tryout period. We want to instill in our athletes that they are very fortunate to be healthy and playing a sport they love and should be leaders in giving back to the community.